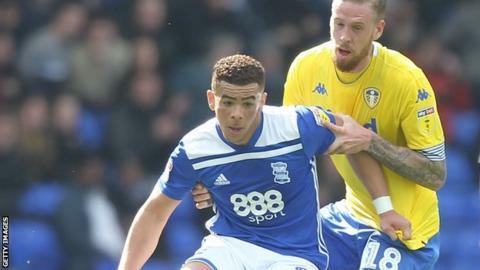 Premier League promotion hopefuls Leeds United slipped to a potentially damaging defeat at struggling Birmingham. Blues were deducted nine points by the EFL for breaching profitability and sustainability rules in March and had lost their previous five games. However, they scored the only goal of the game when Che Adams scored with a crisp strike moments after Patrick Bamford had volleyed against the post for the visitors. Bamford missed another fine chance before Blues goalkeeper Lee Camp denied him a leveller with an excellent save, as Leeds slipped to third in the Championship - one point behind Sheffield United, who won at Preston. Marcelo Bielsa's side lacked their usual fluency as they fell to a second defeat in three matches - and their second this season against Blues, who won 2-1 at Elland Road thanks to an Adams double in September. They started on top but the game turned on a 60-second period when Bamford hit the upright from Luke Ayling's cross and Adams scored his 22nd goal of the season. Birmingham, under former Leeds boss Garry Monk, dug in thereafter and came close to a late second when Adams was denied by visiting keeper Kiko Casilla. Blues' first win since 26 February lifts them five points clear of danger. They now host another promotion chasing side Sheffield United on Wednesday, while Leeds travel to Preston on Tuesday. "We got exactly what we deserved. To get the performance we got, I'm most pleased for two reasons. "First is the players. They've had so much to deal with this season. Defensively, we were brilliant. I felt calm. We looked solid and really well organised. "The second is the fans. It's been tough all season long, especially in this recent run, but for them to turn up in their numbers like they did and get behind the players." "We could draw the game, we could have lost the game with more goals and we could have won the game too. "On balance we didn't do enough and we didn't take advantage of the chances we had." Attempt saved. David Davis (Birmingham City) left footed shot from the left side of the box is saved in the bottom left corner. Assisted by Jacques Maghoma. Corner, Leeds United. Conceded by Lukas Jutkiewicz. Corner, Birmingham City. Conceded by Pontus Jansson. Attempt blocked. Michael Morrison (Birmingham City) right footed shot from the centre of the box is blocked. Assisted by David Davis. Attempt saved. Che Adams (Birmingham City) left footed shot from the left side of the box is saved in the top centre of the goal. Assisted by Jota. Hand ball by Tyler Roberts (Leeds United). Pablo Hernández (Leeds United) is shown the yellow card. Corner, Leeds United. Conceded by Wes Harding. Attempt blocked. Pontus Jansson (Leeds United) right footed shot from the centre of the box is blocked. Assisted by Pablo Hernández with a cross.